It looks like the Springfield Republican has selected our first topic- water/ sewer rebates. When town residents opened their recent water/ sewer bills, many were shocked to see a very large increase even though their water consumption may not have changed. 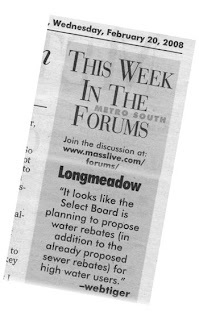 To be fair to the Select Board, the higher water rates were well advertised in advance both in the Springfield Republican and on the town websites (http://www.longmeadow.org/ + http://www.longmeadowbiz.com/). Many of us like the appearance of green lawns and healthy shrubs so we use water on a regular basis to irrigate our landscapes. With a little homework all of us probably could have calculated the new charges before we opened our water/sewer bills. One afterthought.... timing of the increase and subsequent billing might have been planned differently. The recent Proposition 2½ override might have been voted down if the water/sewer bills in some precincts have been delivered only a few days earlier. In some cases the increase in water/sewer fee was double (or greater) the increase in RE property taxes that resulted from the Proposition 2½ override passage. Now to the current issue at hand... rebates for water/sewer. Upon much pressure from constitutents and others, the Select Board voted to rebate sewer charges for residential users only above 110 HCF for the July-Dec 2007 period only because such high water usage likely was caused by lawn irrigation or pool water usage. Such additional water consumption does not result in higher sewer usage. There is now a Special Town Meeting scheduled for March 4 to rebate sewer fees.... voter approval is necessary for checks to be issued. To see if the Town will appropriate an amount not to exceed $356,591.00 from the Sewer Retained Earnings Account in order to provide refunds for sewer bills issued between July 1, 2007 and December 31, 2007, or take any action relative thereto. In addition, the Select Board decided at their February 14 special meeting to rebate water fees as well (for high volume users in the July- December 2007 period) by reducing the charges to a flat rate schedule. Residential and commercial water use charges for July 1, through December 31, 2007 will be abated so that any use above 26 units is billed at a rate of $1.75/per unit. According to Robin Crosbie, Town Manager, there is no voter approval required for these water refunds. Take the time to cast your vote on this subject in our poll (see top right section of this page). To vote you may have to create a Google account. Not a big deal... takes 1-2 minutes. Once you have signed up you will also be able to post comments on this topic. New subject posts to this forum will only be allowed by approved contributors- each of whom must have a Google account. Whether or not regular contributors reveal their true identity will be a personal decision. We hope to solicit involvement of the Town Manager, School Superintendent, School Committee Chair and others to help enrich the debate on this forum. We are currently soliciting people interested in becoming regular contributors to this new forum. Subjects will be limited to local issues rather than state or national issues or general politics. Interested people should send their letter of interest to: longmeadowbuzz@comcast.net. Please include your name and phone number. Reader comments to this forum will be allowed by anyone with a Google account. By requiring Google accounts authorship of posts + comments should be reasonably secure. Comments will be "moderated" prior to their appearance in the forum so as to exclude irrelevant or obnoxius responses. This forum is an attempt to provide a means for constructive debate about issues facing our town. We hope that participants will behave in a responsible and courteous manner or else this effort will end up in the same situation as the Mass Live forum where such debate is not possible. If you are not interested in what we are trying to do, please stay away!